Dell today announced its expanded Inspiron laptop portfolio just in time for graduation and the upcoming back to school period. Parents today want to give their kids the best advantages, and Dell is offering its tailored line-up of Inspiron laptops for the unique needs of families and students. With three series of Inspiron laptops – the Inspiron z series for thin & powerful style on the go, the Inspiron R series for everyday family computing activities, and the Inspiron R Special Edition series for studio-quality multimedia and audio – parents and students can find the laptop best suited to them on Dell.com. Equipped with the latest technology, customers will have peace of mind knowing that their Inspiron purchase is a smart investment for the family, whether for school work and learning online, multimedia and entertainment, or for household organization. All Inspiron laptops announced today will offer options with Intel’s new 3rd Generation Core i processors (Ivy Bridge), Microsoft Windows 7 Home Premium operating system, and will be eligible for the Microsoft Windows 8 upgrade program. "The Inspiron laptops are the perfect investment for our tech savvy moms, with 73 percent purchasing computers in the last year and 65 percent planning to buy laptops next year," said Tina Wells, CEO of youth marketing agency, Buzz Marketing Group. "We surveyed over 600 Millennial Moms with close to half citing functionality as the most significant factor when making technology purchases. With the new Dell Inspiron family, moms - and their families - will get both functionality and style thanks to this series' versatile capabilities and chic appearance." Dell’s first Inspiron Ultrabook, the Inspiron 14z, will be hot on any student’s graduation gift wish list with its ultraportable design, great performance and fast response time. The 14z is Dell’s second Ultrabook offering, joining the successful XPS 13, and blends Intel Rapid Start Technology[i] for fast boot and resume and up to seven hours of battery life[ii]. With a premium brushed aluminum finish in two color choices, Moon Silver and, coming later this summer, Fire Red, the Inspiron 14z is a well-built, well-specified Ultrabook at a great value for student budgets. Starting at 4.12 pounds (1.87kg)[iii], and 0.83-inches (21mm) at its thickest point, it’s light and easy to carry in a backpack or tote. Rounding out the Inspiron z series portfolio is the Inspiron 13z, a stylish, fun addition to the Inspiron line-up. With a range of available color SWITCH lids[iv] for customizing - Moon Silver (standard), Fire Red and Lotus Pink - up to seven and a half hours of battery life[v], and starting at a mere 3.81 pounds (1.73kg)[iii], and 0.82-inches (20.7mm), students will enjoy ultraportable style with the latest technology for both homework and fun. 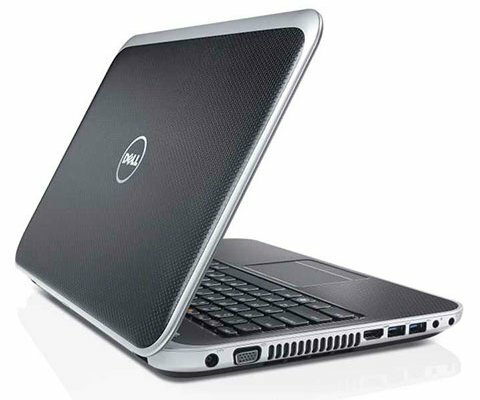 Both laptops offer mobile broadband[vi] as an option with Dell NetReady mobile broadband service. Providing connectivity on a session-based model, Dell NetReady is a “pay-as-you-go” service that allows connection where Wi-Fi may not be available[vii]. The Inspiron 15R and Inspiron 17R are fashionable, full-featured laptops for smart everyday computing. The high-definition display, advanced audio with Waves MaxxAudio 3 technology, full connectivity, and a variety of processor, memory and hard drive options, make them great all-round family entertainment laptops. The optional color SWITCH lids[iv] make the laptops easily customizable to reflect one’s personality or favorite color. Whether video-chatting with family across the country, doing homework, balancing the family budget, or watching videos via Intel Wireless Display[viii] to a 1080p / 5.1 surround-compliant home theatre, users will find the Inspiron R to be an essential part of the family. Inspiron R Special Edition laptops: immersive entertainment and enhanced audio The new Inspiron Special Edition series provides robust performance and premium features for immersive entertainment and multimedia activities previously unavailable under the Inspiron brand. An expansion of Dell’s Inspiron portfolio, the Inspiron 15R Special Edition and 17R Special Edition allow customers to enjoy advanced audio and graphics for multimedia entertainment including studio-quality Waves MaxxAudio 4 audio suite and Skullcandy speakers, and standard discrete graphics from AMD (Inspiron 15R Special Edition) and NVIDIA (Inspiron 17R Special Edition). The new Inspiron R Special Edition laptops feature a sleek and durable anodized aluminum exterior in Stealth Black, Full HD display (1920x1080) for stunning video playback, including Blu-ray disc options. The Inspiron 17R Special Edition is also available with a super bright 400 nit Full HD display or an optional Full HD 3D[ix] display. With backlit keyboards, and optional mSATA SSD devices with Intel Rapid Start Technologyi for fast boot and sleep resume times, the Inspiron R Special Edition laptops are packed with technology and features to make multimedia a real pleasure. Inspiron 14z: Available today in select countries in Asia, June 19 in the U.S. and Canada, and in select countries in Europe and Latin America later this summer, starting at $699.99 USD. Inspiron 13z: Available today in select countries in Asia, and June 19 in the U.S. and Canada, starting at $599.99 USD. Inspiron 15R: Available today in select countries in Europe and Asia, and June 19 in the U.S. and Canada, starting at $549.99 USD. Inspiron 17R: Available today in select countries in Europe, and June 19 in the U.S. and Canada, starting at $599.99 USD. Inspiron 15R Special Edition: Available today in select countries in Europe, Asia and Latin America, and June 19 in the U.S. and Canada, starting at $899.99 USD. Inspiron 17R Special Edition: Available today in select countries in Europe and Asia, and June 19 in the U.S. and Canada, starting at $1,099.99 USD ($1,299.99 with 3D).